Stationary objects (fuel storage tanks, generators, refrigerators, fueling stations, electric transformers etc.). Different type of monitoring (selected by customer): office PC based monitoring or WEB monitoring service. 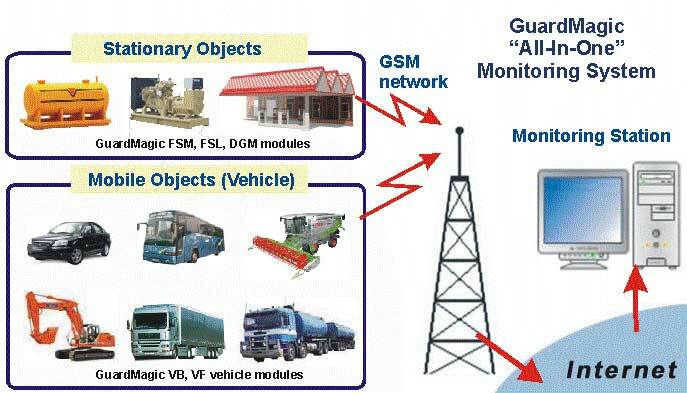 All-In-One Monitoring system allows to have (monitor) different type of objects in one system. in your office server (PC) you install monitoring software VehicleStation or FleetStation series. All data stored in your office server. Your login from any computer by internet to your account in special monitoring site. You need not to have any special server or PC in your office. All data stored in monitoring data center.